Wednesday, October 12: support California prisoners on day 16 of their historic hunger strike at an interactive installation at UC Berkeley, featuring visuals, readings of prisoners' letters, and family members. Students and professors, family members with loved ones in prison, members of the legal, human and civil rights community -- join us in reading prisoner letters, holding photos of prison conditions, sharing your thoughts, discussing how to support the prisoners. Please forward this call widely, announce in classes, email us messages of support to be read. Think about everything that makes you human… that keeps you physically and mentally alive… that connects you with the world and other people… that gives you a reason to live, to love, to learn and think…. All this is what the SHU tries to extinguish. In the SHU you're locked up in a small, windowless concrete cell 23 hours a day, with minimum human contact and maximum sensory deprivation, for years and sometimes decades. On October 4, Amnesty International called for "swift implementation of reforms to California security housing units," and condemned "conditions in the SHUs at Pelican Bay and other facilities, where several thousand prisoners are held in isolation, confined to windowless cells for more than 22 hours a day, with minimal human contact and no work, recreational or educational programs." Prisoners write: "our sacrifice now will mean a more humane world for us in the future…many of the conditions for prisoners being held in Guantanamo Bay are really better than SHU prisoners in Pelican Bay." 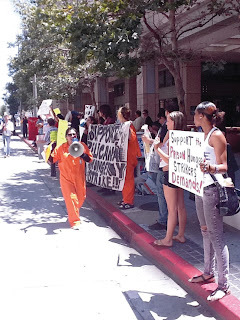 All of us have a moral responsibility to stand up for the basic rights and humanity of those held behind bars, and build a determined movement outside prison walls demanding CDCR grant the prisoners' just demands and immediately halt its retaliation against hunger strikers.